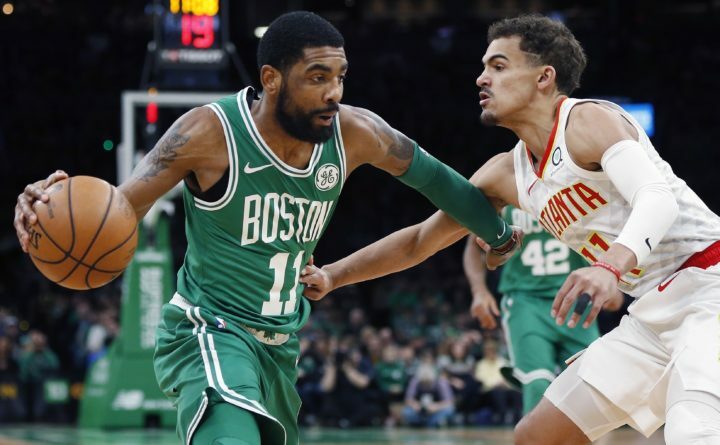 Boston Celtics' Kyrie Irving, left, drives past Atlanta Hawks' Trae Young during the first half of an NBA basketball game in Boston on Saturday. BOSTON — What looked like an easy day for the Boston Celtics turned into a fight to the finish. It’s something they’ve got to clean up heading into the postseason. It could have been a costly victory for the Celtics after forward Gordon Hayward suffered a strained neck early in the game and didn’t return. Hayward banged his head into the shoulder of Atlanta’s John Collins, who was setting a screen, and looked dazed before he went to the locker room. Celtics coach Brad Stevens said Hayward was “woozy” from the hit and was sent home after halftime. After Boston squandered the 25-point lead, Brown nailed his 3 from the right corner, sparking a 9-0 spurt that gave the Celtics a 121-112 edge with 3½ minutes left. The Celtics held their large lead late in the third but got just one basket in 7½ minutes — on a three-point play by Tatum — when the Hawks outscored them 28-6 to cut it to 109-106 on Young’s 3-pointer with 7:25 to play. “It’s maddening because what happened in the end of third, early fourth, was they ratcheted up their pressure and we were on our heels and you could see it,” Stevens said. Atlanta tied it at 112 on Kent Bazemore’s two free throws. Boston led by 12 at halftime and went on a 15-3 run midway into the third to push its lead to 103-78 on Irving’s step-back 3-pointer from the left wing. “To be down  in the third and to tie the ballgame up is a testament to the guys in that locker room — young, old, whatever you want to call them,” Hawks coach Lloyd Pierce said. Celtics: Horford went to the locker room early in the third after banging knees, returned to ride an exercise bike and got treatment on the sideline before returning midway through the fourth. … A few Celtics players became sick when they returned from their West Coast trip earlier this week. Reserve center Daniel Theis and backup point guard Terry Rozier missed Thursday’s win over the Sacramento because of illness, but they played Saturday. There was an interesting matchup between Celtics star Irving and Young, Atlanta’s promising rookie. Boston’s season high for any quarter is 45 points against the Hawks in Atlanta on Nov. 23. The Celtics had 43 in the first Saturday.